A group of eight international fashion retailers, including H&M, Inditex (the owner of Zara) and Britain’s Primark, announced last week that they would support fair living wages for Cambodian garment workers and were prepared to factor such wages into their pricing. The official support came just days after the Cambodian government, for the second time this year, deployed armed troops in response to rallies by garment workers seeking higher minimum wages. On Sept. 17, thousands of textile workers gathered in and around Cambodia’s capital, Phnom Penh, demanding a significant increase in the monthly minimum wage, from $100 to $177. A previous demand for a wage hike to $160 had been rejected by employers, who earlier this year raised wages to $100 from around $80. Importantly, no incidents of violence against either police or protesters were reported, in contrast to the government’s response to a January 2014 protest, when Cambodian troops opened fire on striking workers -- killing at least four and injuring many more. Cambodia’s garment industry has exploded in recent years, due in part to lower wages there as compared to those now being paid in China and Vietnam. The garment sector in Cambodia now represents roughly a third of the country’s GDP and employs more than 600,000 people. Despite the rapidity of its recent growth, Cambodia’s role as a major supplier for the industry can be traced back to the mid-1990s, when the country became a market economy and enacted laws that incentivized investment in the garment industry. 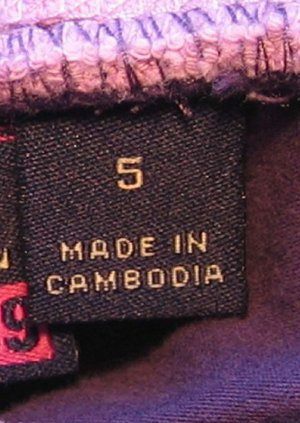 In 1999, after the industry’s significant development led to concerns about working conditions, the U.S. and Cambodia entered into a bilateral textile trade agreement (BTTA), which pegged U.S. import quotas to certain improvements in Cambodian factories. This, along with the International Labor Organization’s (ILO) creation of Better Factories Cambodia to monitor compliance with the BTTA, encouraged the Cambodian government to strengthen working conditions in the sector. The support of the group of eight retailers is, of course, welcome and timely. Although garment workers in Cambodia have seen (comparatively) significant wage increases in the last year or so, wages had dropped nearly 20 percent in the 10 years prior. The fact that major international purchasers are now publicly throwing their support behind the workers could give unions additional leverage when government officials and union representatives meet in October to discuss wages for the sector. Not to discount the role of Cambodia’s government, but it bears mentioning that unsafe working conditions and paltry wages are partly the result of retailers’ efforts to satiate consumers’ apparent desire for cheap clothing. This demand -- real or otherwise -- for lower prices has largely been successful. In a time when the cost of all consumer goods has increased substantially (64 percent over the last decade), the price of clothing has actually fallen (by 3.3 percent over the same period). Yet, retailers’ willingness to pay more for their product (by supporting living wages for those who make it) will hardly change the cost to consumers, as factory wages account for just 1 to 3 percent of an item’s price. Moreover, consumers might even be willing to pay more for responsibly sourced clothing. Late last year, H&M made a broader commitment: to ensure that all of its strategic suppliers are prepared to pay their employees fair living wages by 2018. In the wake of the Rana Plaza disaster last year in Bangladesh, H&M appears to be taking its commitment to social responsibility more seriously. Yet, H&M and others will need to do more than just make pledges and issue promise-laden sustainability reports. How H&M handles the situation in Cambodia should give a good indication of how serious the company is about social responsibility in its supply chain. Notably absent as signatories to the H&M letter are the likes of Walmart, Levi’s, Gap, Puma, Adidas and Nike -- all of which are major Cambodian buyers. There’s also the matter of the United States government, which in 2012 imported $38 million in textiles and $2.6 billion in clothing from Cambodia. This, despite the fact that human rights abuses are well-documented in Cambodian factories (and the factories in other developing nations where the U.S. government does most of its procurement). In some cases, serious human rights abuses have been documented at Cambodian factories producing clothing explicitly for the U.S. government. For example, according to a report by the International Corporate Accountability Roundtable, in 2014, “close to two dozen underage workers, some as young as fifteen years old, were found working at a factory that makes clothes sold by the Army and Air Force.” Current U.S. practices are a far cry from those that led to improvements in Cambodian factories just 15 years ago.